We took advantage of a beautiful long weekend in mid-September 2015 to hike the Elk Meadows area on the SE flank of Mt. 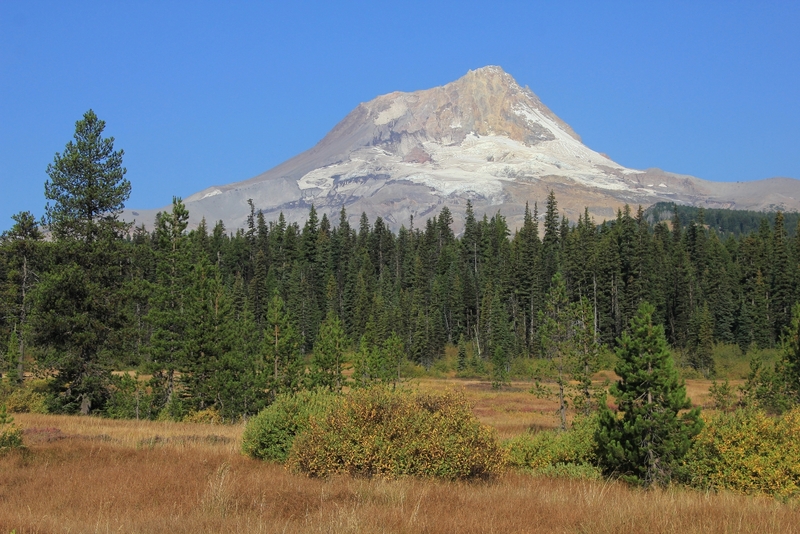 Hood, Paradise Park near Timberline Lodge at Mt. 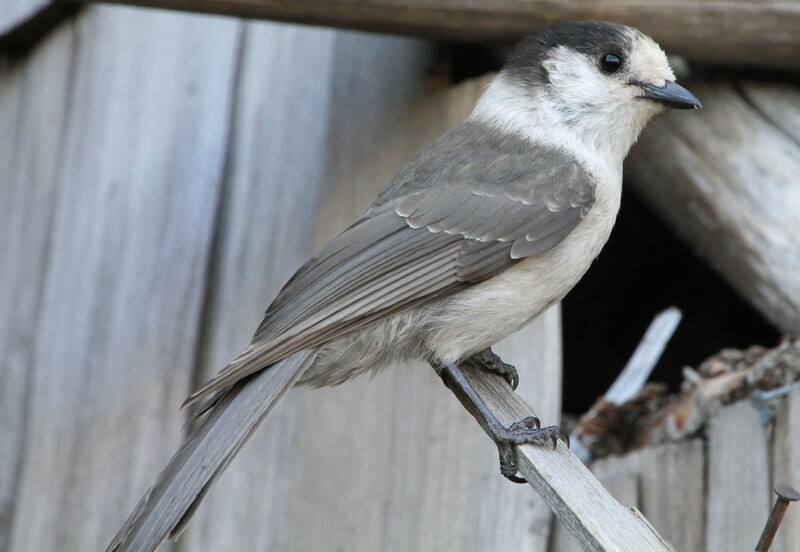 Hood (see post here), and Eagle Creek in the Columbia Gorge (see post here). 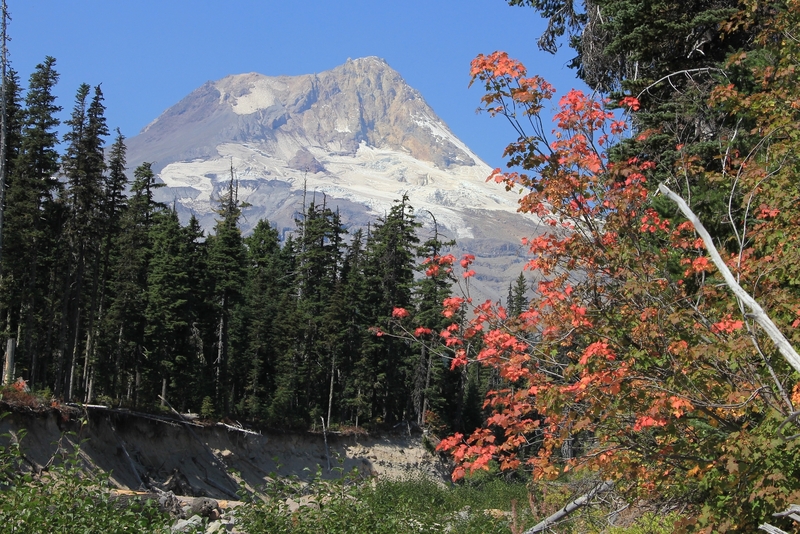 On Friday, September 11, we drove from our home in southeastern Washington to Hood River, Oregon. Here we turned south onto OR-35 Mt. Hood Scenic Byway. I had been this way before, but the last time was in about 1989. After setting up camp along Hood River, we drove to the Elk Meadows Trailhead to make short hikes to Umbrella and Sahalie Falls. There are several different options for viewing these falls. 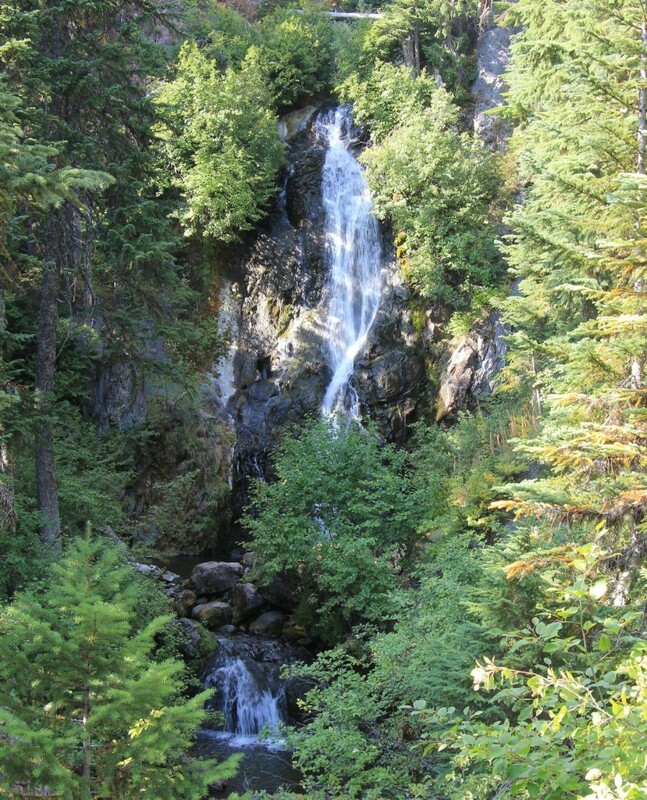 The easiest is to drive to the base of Sahalie Falls along an old stretch of the highway then drive a short distance toward the Elk Meadows Ski Lodge and make a short and easy hike to Umbrella Falls. 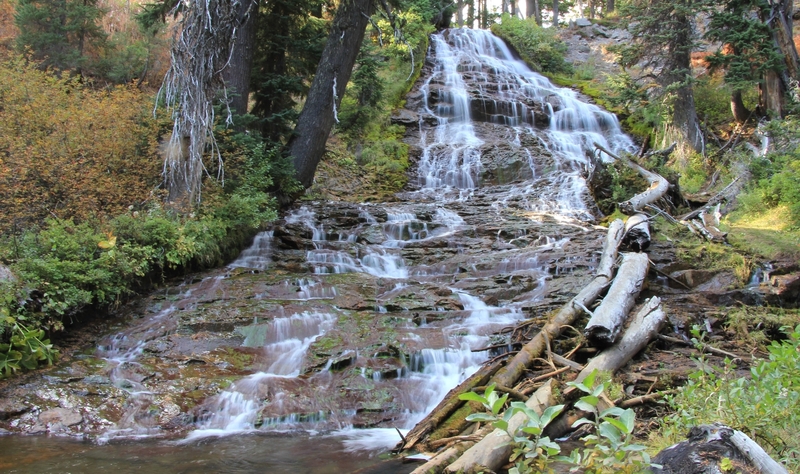 Ambitious hikers can make a 4.4 mile loop hike to the two falls from the Elk Meadows trailhead. We did a hybrid of the two options resulting in a 2.0 mile hike. Saturday morning we set out early to enjoy a beautiful late summer day. We headed back to the Elk Meadows Trailhead (elevation 4,470′) where we found only a few other cars, likely backpackers. It looked like we’d be on the trail before everyone else which was nice. By 7:30, we had our gear and were hitting the trail to Elk Meadows. The trail started with a very gentle climb as it snaked through dense forest. 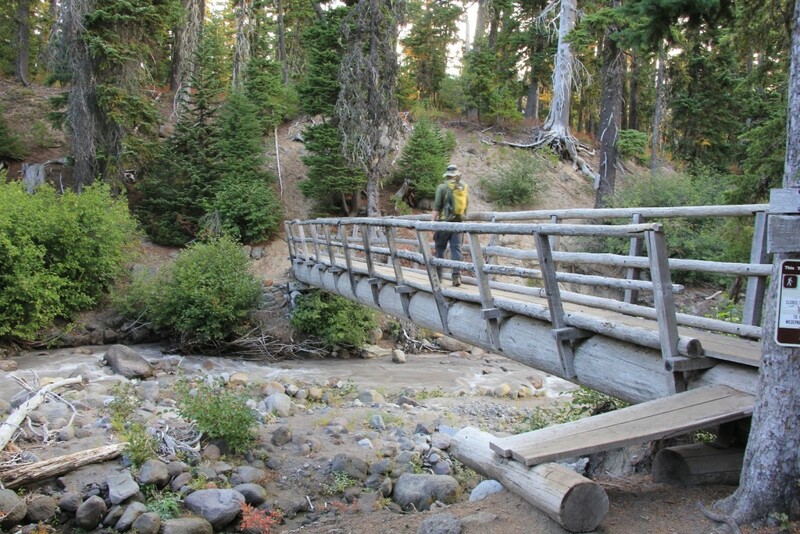 At the wilderness boundary, the trail crossed Clark Creek on a good foot bridge. At 1.2 miles, we arrived at Newton Creek which we read could be a problem during high water. Here we found a cute little stream running through a rocky river bed. 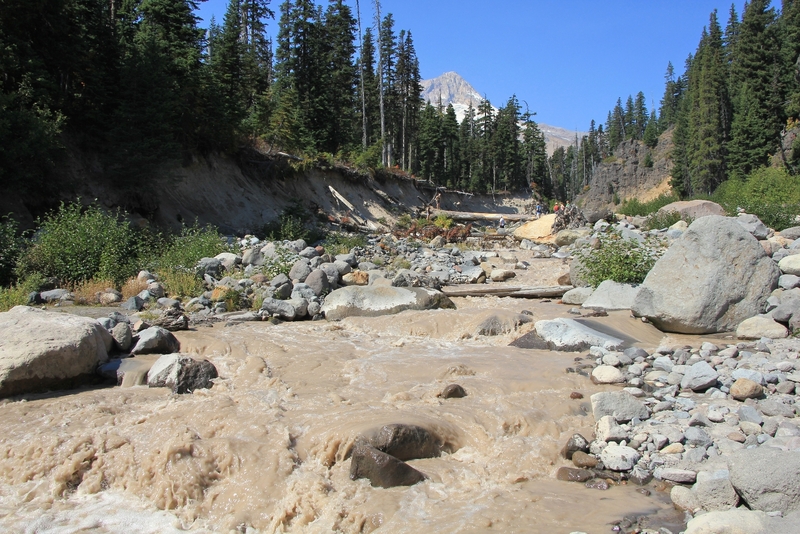 You could tell that massive amounts of snow melt would easily turn this cute little stream into a river. 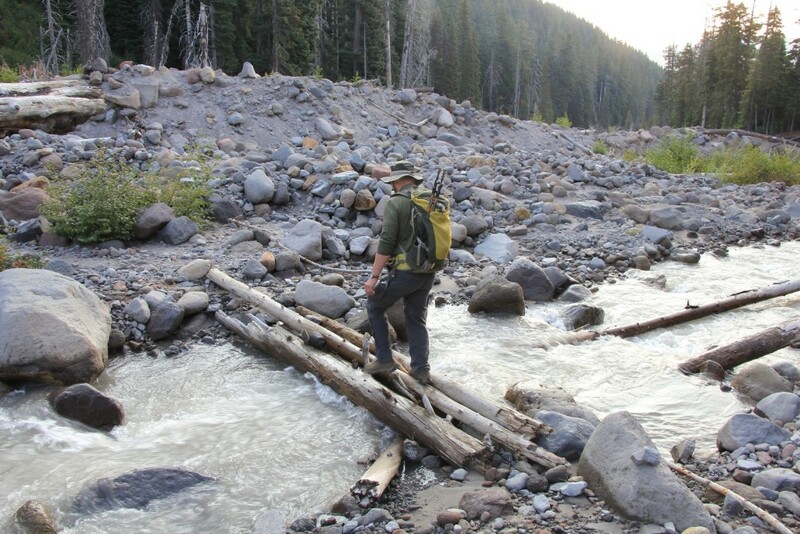 There was no bridge, but we found 3 logs that had been placed across the creek and we were easily able to cross. From Newton Creek, the trail immediately began a one mile climb of 600’. The trail was well graded with 8 switchbacks and was a relatively easy climb for most of that stretch. 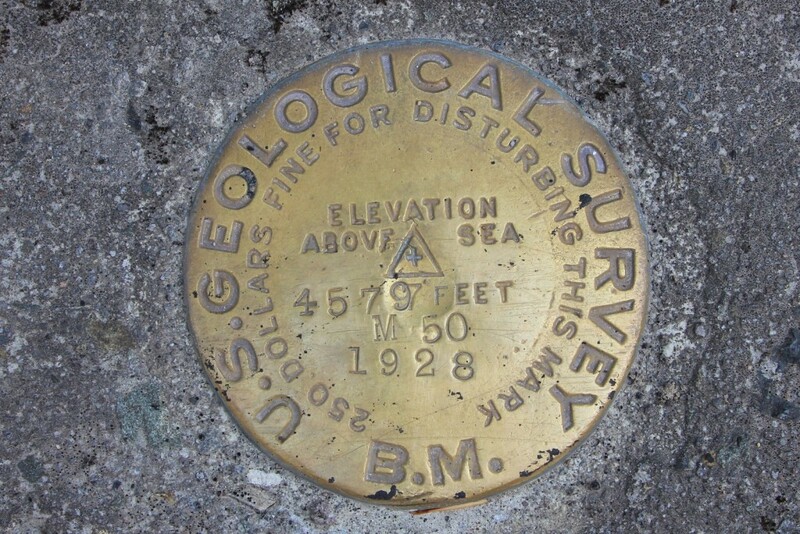 We topped out at 5,250’ where we found a split to the left that takes hikers up Gnarl Ridge to Lamberson Butte. We continued straight ahead and in another 0.2 miles came to a Y junction. Each direction takes you on a 1.2 mile loop around Elk Meadows. We took the left and made the loop clockwise. We saw a couple people from a distance and guessed that they were camped somewhere around the meadows. Much of the loop around Elk Meadows takes you through dense forest without any views. At the northeast corner of the loop, we located the small side trail that took us to the 3 sided Elk Meadows shelter (N45°20.6816 W121°36.9477 elev 5,198’). Here we found a spectacular view of Elk Meadows with Mt. Hood in the distance. We had the shelter to ourselves aside from a chattering jay. Even with the dry summer, the meadows had a lot of marshy areas and small little streams. I would love to backpack here in the early summer months when the flowers are in bloom—I can imagine the mosquitoes are quite horrible at times. 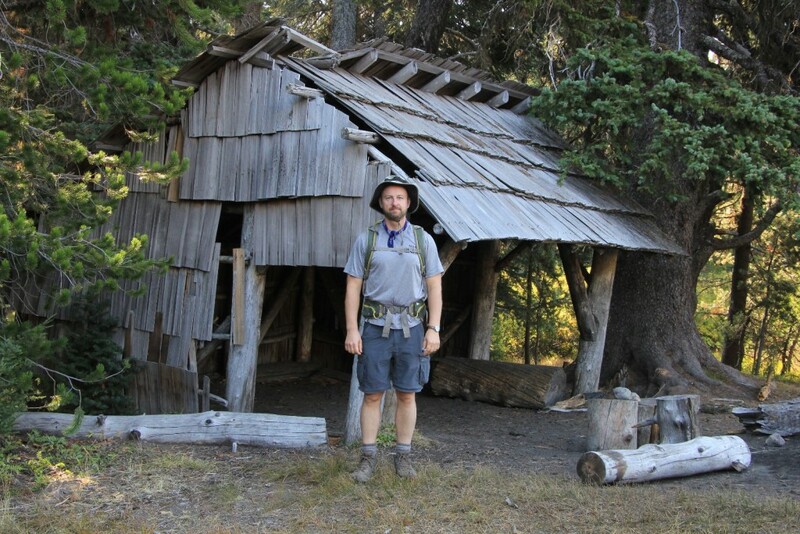 We finished the loop and found ourselves back at the Newton Creek-Gnarl Ridge junction. We decided to lengthen the hike since it was only 10:00. We turned right and started hiking along the Gnarl Ridge trail. I was hoping we’d get into some good views of the mountain, but mostly we were in forest without views. We climbed about 1,250’ in elevation for a couple miles, but began to run low on water as temperatures climbed into the upper 70s. We hadn’t planned on this long of a hike and there were no streams here for us to filter water from. 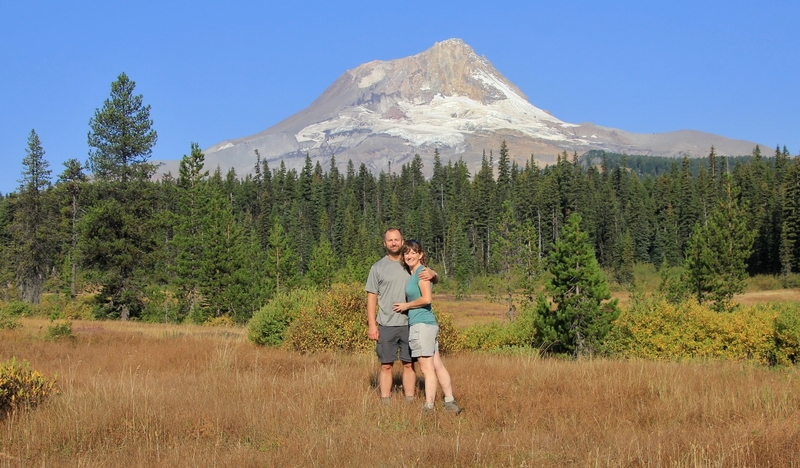 We got some good exercise, but fell short of Lamberson Butte which I suspect has great views. 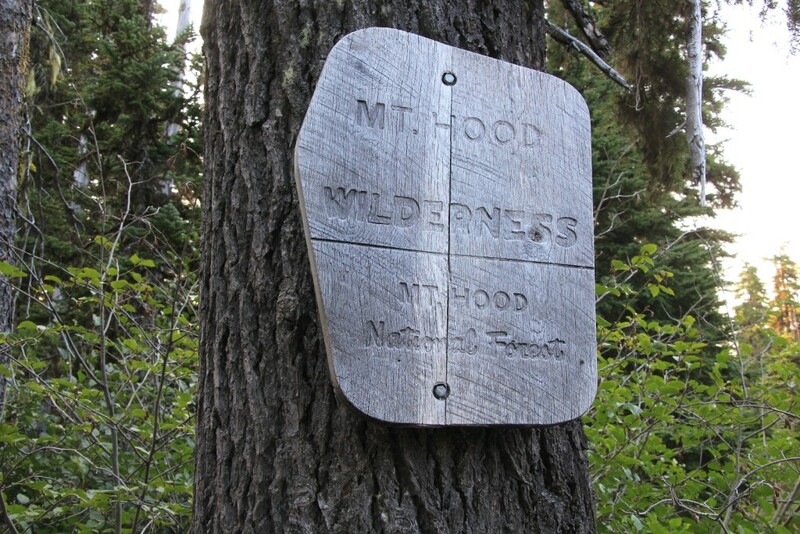 Once we rejoined the Elk Meadows trail and began the descent to Newton Creek, we ran into several people. They all looked warm making the climb in the heat of the day making me happy for our cool early start with no one else on the trail. We reached Newton Creek about 1:00 and were stunned to see how much the water level had risen since we had been there at 8:00. Temperatures were now around 80 degrees and snow run off was coming down the mountain. The little footbridge we had crossed on was gone. Groups on both sides of the creek were trying to figure a safe way across. Rock hopping was out of the question. There was a large tree up the way that a few people were crossing, but it looked sketchy to me. Jason stepped in at a place he thought looked the shallowest and crossed without problem. I ended up crossing a short distance up the creek where there was a small log that I could hang onto. The cold water hit about mid-thigh on me, fortunately it wasn’t more than a dozen steps across. A young couple with a small dog crossed behind me. They had quite the time getting their little dog across. We finished the day in the small town of Government Camp with bacon cheeseburgers at the Mt. Hood Brewing Company. 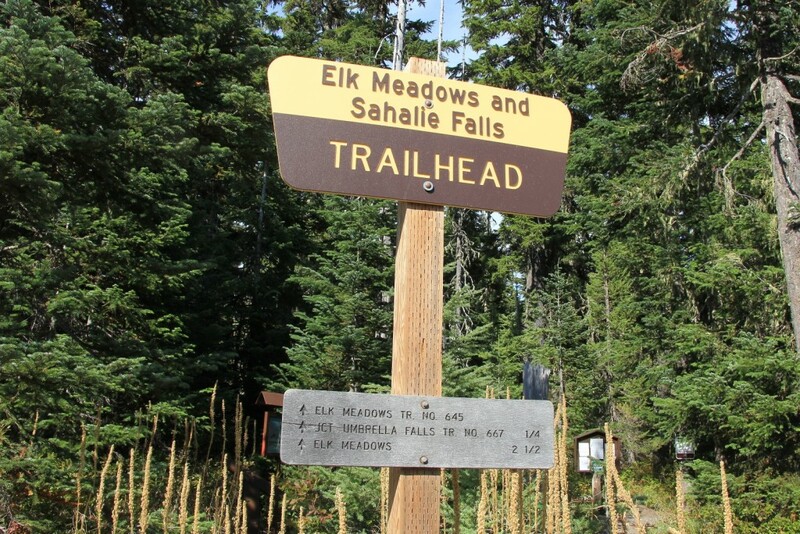 Directions to Elk Meadows Trailhead: From Hood River, Oregon, take OR-35 south to Forest Service Road 3545 to the right which immediately brings you to the well signed Elk Meadows Trailhead. You did a good job on this Lusha . You covered the main parts well and with great photos too . I’ll be looking forward to seeing more on this site . Thank you for stopping buy and for your nice note Richard! Hi guys, Just a general question – what is the name of the lake pictured at the top of the page? 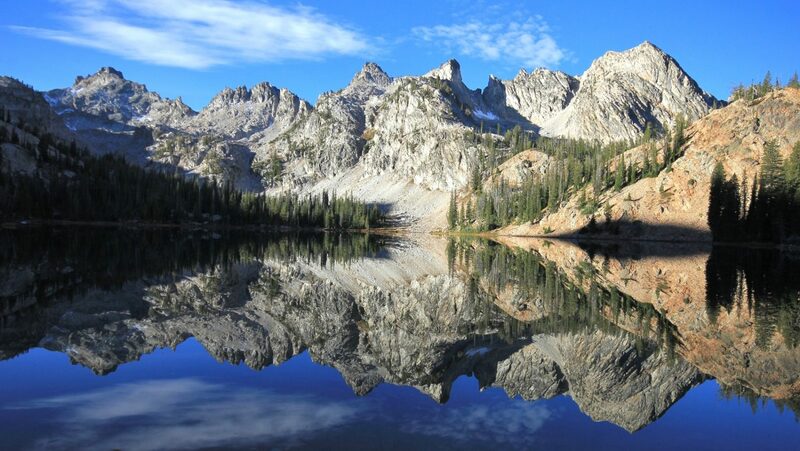 I’m researching for an upcoming Pacific Northwest trip and I’m hoping its there somewhere… I don’t think I need to comment on how great the picture is – all I can say is if it photographs that well imagine how awesome it’d be to see it in person! Thanks, Baz.